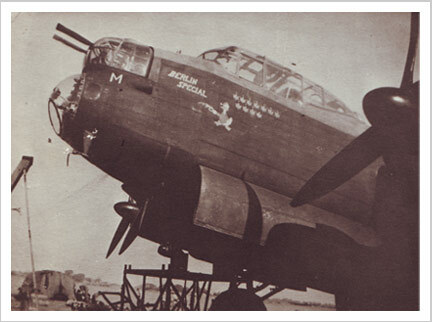 I was out at the dispersal point where our Lanc II was berthed, the armourers suddenly turned up with a bomb train and the word was ops tonight. The two gunners were also out there with me cleaning the Perspex etc; we soon got a lift back to the mess. Briefing was due at 5, and signs went up all round when the curtain was drawn from the map showing Hamburg. The only new thing was we were to have an extra gunner, with a free mounted .5 sticking out of a hatch under the top turret. After we had kitted up and got back to the plane we found the armourer had already got the gun in position. The new gunner was a French Canadian called Blais. He did not have much to say and we knew how he would feel. Doing a trip away from your regular crew was a bind, but we all had to do it occasionally as pilots had two familiarisation ops to do on joining the squadron; so the only way we could synchronise so we all finished together was to substitute with other crews. As usual, I was the last man to board, doing my checks. It was a bright summer evening but somehow nothing seemed to be going right. Jack the tail gunner had a little Scottie pup; it was following me around until I managed to find one of the fitters to tie it up in the hut, then I hauled myself on board ready to start engines. The ground crew waved us clear and we taxied out to take our place on the line-up on the piri track. Soon it was our turn on the runway. The usual crowd of WAAFs waving the planes off were our last sight as we opened up the engines for take-off.